Use Keyhole to get data and optimization strategies for any public Facebook page, whether it belongs to you or a competitor. Inputting the page’s name will reveal metrics surrounding fan growth, engagement by post type and best times to post based on engagement. A unique feature, the tool also calculates the ideal length of your updates by character count. To better understand your own page or the competition’s strategies, you can export these data points — and more — in PDFs and Excel spreadsheets. Try Brand24 to track metrics surrounding conversations across Facebook. It gives a stream of your company’s mentions, but the tool’s analytical value lies in the measurement of these mentions. For example, it quantifies sentiment and the influence of individual users. It also has a discussion volume chart, illustrating spikes and drops in mentions. This helps you visualize the popularity of events and social campaigns. Use Brandwatch to analyze a page’s fan base. Able to track data pertaining to any public page, the tool offers audience analytics such as gender, location, profession and interests. 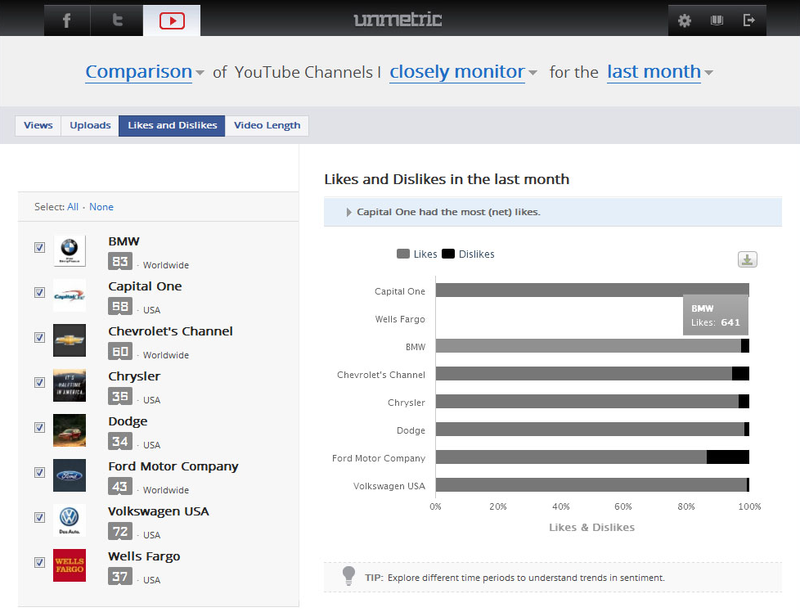 Along with mention volume and sentiment, the tool monitors what audience members are sharing to uncover popular topics. You can use this information to inform your Facebook content strategy, possibly giving you more ideas to post about. Try out Buffer if you need a scheduling tool with complementary analytics. It informs your Facebook strategy by offering basic post metrics, such as engagement, for updates you make through the tool. Based on this data, Buffer identifies your top post each day. To replicate its success, you can model future updates on its content type and posting time. Sign up for Crimson Hexagon to access its library of historical data, which updates every minute. In a variety of charts and graphs, it illustrates page analytics such as sentiment, engagement and demographic information — ranging from age to ethnicity. Like some other tools on this list, you can access data for any public page. Choose Crowdbooster to get straightforward strategy suggestions based on the data it analyzes. Largely focussing on fan analytics, such as activity and influence stats, the tool suggests who to engage and how to improve your interaction efforts. It also measures engagement data in real-time to recommend posting times. You can export this information to Excel, or get it in a weekly performance summary. Consider Cyfe if you want a customizable analytics dashboard. Along with finance and general web metrics, you can add and remove more than 50 Facebook widgets from your dashboard. These widgets track page metrics, post stats and demographic data. For example, you can see how your fan base has grown and engaged with you, as well as information such as their interests. Stick with Facebook Insights if you’re uncomfortable using or paying for a third-party tool. Available for each page you manage, it has basic — yet essential — metrics such as page likes and actions. Differentiating between paid and organic, you can get standard post data — reach, impressions and engagement. It also offers fan demographic information, including gender, location and language. Due to its range of metrics, some tools on this list integrate with Facebook Insights instead of offering unique data points. Measure the performance of your ads using Komfo. It tracks CPC (cost per link click) and CPM (cost per 1,000 impressions), along with reach and engagement numbers. This helps measure ROI metrics, such as conversions. You can also use Komfo to shape your ad targeting strategy because it analyzes the demographics of your fan base. Quantify the financial impact of your social media strategies using Oktopost. The tool tracks conversions while identifying channels and messages that drive financial actions on your website. 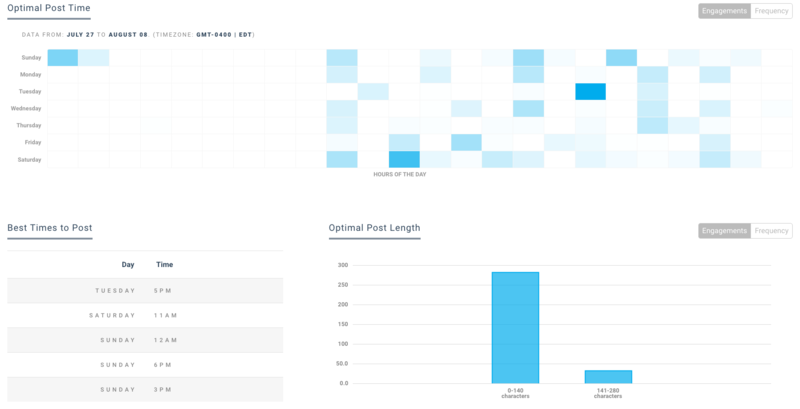 For example, it allows you to confidently say “this new customer came from our latest Facebook post.” Oktopost also uses engagement data to pinpoint the best posting times, allowing you to publish through its dashboard. Try out quintly to measure your pages against competitors. 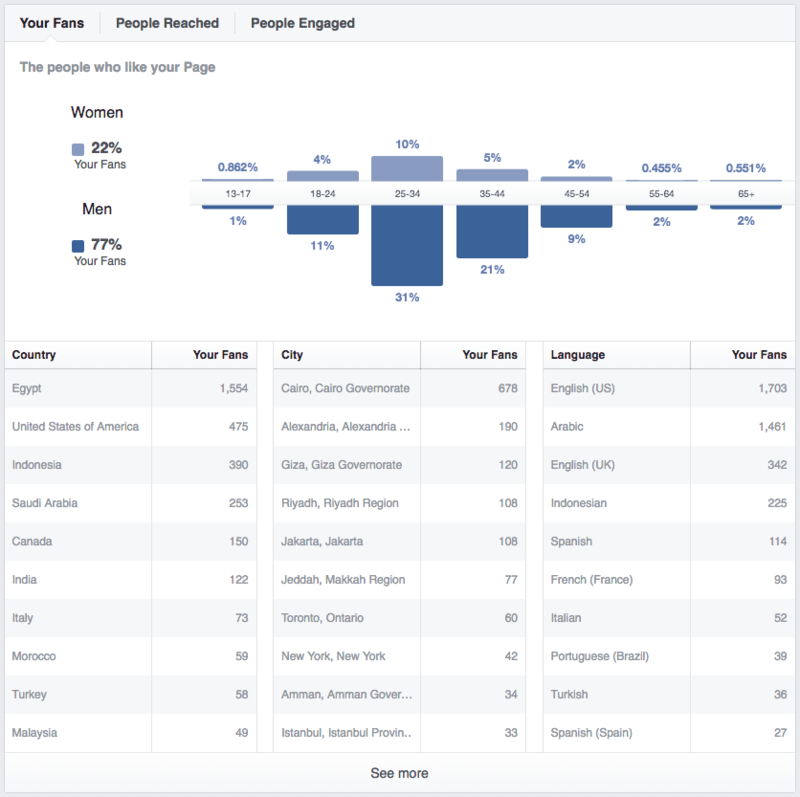 You can access Facebook Insights through the tool, which will allow you to start comparing and contrasting pages. It visualizes stats — such as engagement — from these accounts in single graphs. These sorts of features make quintly a go-to tool for competitive goal setting. Use Rival IQ — another competitive benchmarking tool for Facebook — to track opposing brands and measure your performance against theirs. Prioritizing growth, the tool records how audiences change on weekly, monthly, quarterly and annual bases. By giving you access to historical data, you can correlate audience size fluctuations to major events and business cycles. This pinpoints when rival are expanding their fan bases. 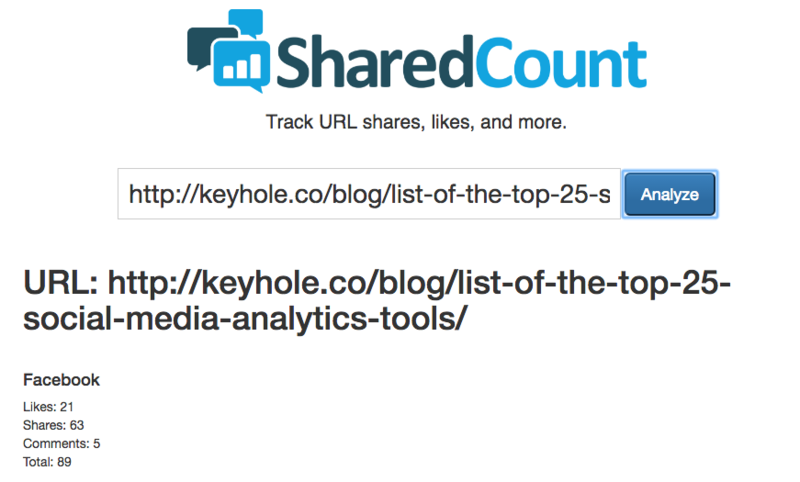 Take SharedCount’s name literally. Answering more than a billion requests per month, the website tracks the social like, share and comment counts of content pieces. To see these stats, simply paste a URL into the search bar. 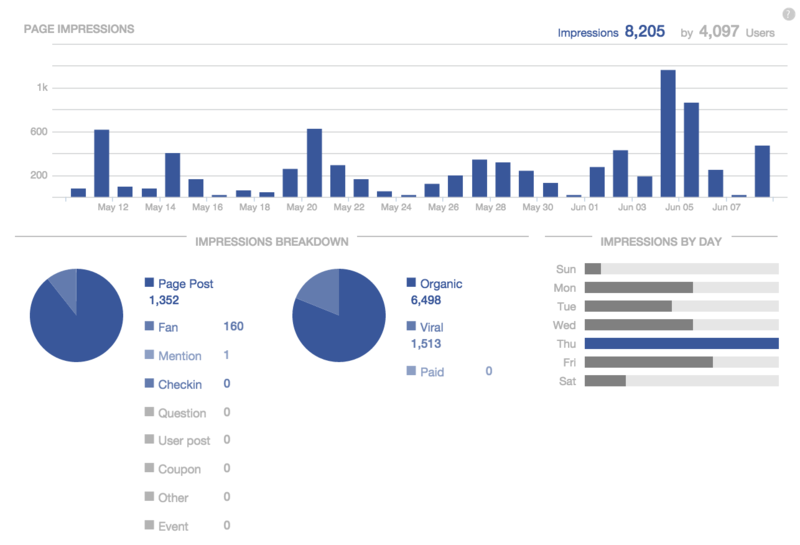 Use Simply Measured to track the impact of Facebook activity on your website. By connecting to Google Analytics, you can see information about how visitors from the social network are acting and converting on your website. The tool also lets you measure Facebook metrics against those of other channels, such as Twitter and Google+. This gives you a way to easily and cleanly compare results between platforms. Try Socialbakers if you need a comprehensive dataset above all else. The features include custom benchmarking and competitive analysis, allowing you to create groups to track your Facebook performance against. The tool also differentiates between paid and non-paid content when measuring post performance. And of interest to companies with a worldwide presence, Socialbakers can segment data by individual brand and country. Access metrics for Facebook groups by using Sociograph. You can analyze a community’s activity over the course of a year, month or custom time range. This will identify influential group members based on likes, comments and shares they’ve earned through submitted posts. You can also sort posts by engagement. Plus, Sociograph has a feature to generate analytics reports for any public community. Collect metrics from any public page in a single dashboard with Sotrender, allowing you to measure your performance and research competitors. On top of audience demographic information, the tool offers data such as post reach and impressions. You can see how these metrics vary between update types, including ones that have photos, videos and just text. Using the numbers it tracks, Sotrender makes suggestions about when to post and which kinds of media to use. Choose Sprout Social to monitor the numbers behind different Facebook pages in one dashboard. As well as an inbox that brings messages from all pages into a filterable stream, you can access data visualizations for post metrics such as impressions and engagements. The platform also tracks page data, including fan growth. You can export these analytics to PDFs and CSVs. Connect unlimited Facebook accounts to SumAll. This feature, along with reports to which you can add your logo, make it an ideal analytics tool for social marketing agencies. SumAll focuses on goal setting and completion, charting your progress with standard growth and engagement metrics. You can set the tool to send emails summarizing this data, helping you stay on top of different accounts you handle. Use Unmetric to guide your growth strategy through its reporting and historical analysis features. Containing Facebook Insights data, it emails you Excel and PowerPoint reports depending on the frequency you set. The metrics can be up to four years old, helping you find out how well past strategies worked for you and your competitors. Unmetric also separates paid from organic numbers when analyzing posts for standard metrics such as engagement. Use this list of 20 Facebook analytics tools as your guide to, at the very least, simplify the research and decision processes.